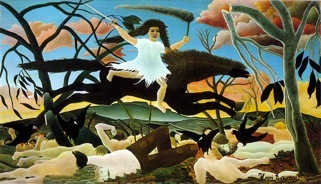 Gregory Whitehead Can you describe your response to Henri Rousseau’s “La Guerre”, on first viewing? Morgan Bulkeley Insane horse and rider– eyeless horse extended over ground composed of corpses – the rider not really seated on the horse – almost floating in front of the steed defying gravity and sanity – putrid blood pink clouds. The whole image eerily without hope or humanity, a world dedicated to death. Who is this tattered imbecile leering with her sword and smoking stick reveling in the apocalypse? Horror. GW Yes, and the wounded, scorched landscape. What do you make of the tree in the foreground, the snapped limb and the gashed bark? It almost seems as if the berserker, having run out of bodies to cut down, is now on the rampage against the trees. And the use of color, for the bodies, the “greening” of the dead, the blurring of the line between landscape and woundscape. The corpses seem to be sinking into the ground; or maybe the earth is sucking them in? MB It seems all life is being snuffed out; the leaves – what few there are – look wilted, and the crows are feasting on death. In the background, there are trunks and stumps. Cut or maybe just giving up, the limb seems to be overcome by the assault. Why should the crows be alive; death is their food. I was always fascinated by the horse’s tongue and the silver slivers of horseshoes, maybe the only remnants of technology along with the sword, and that weird splintered dress. GW Was Rousseau’s “War” on your mind when you began working on your own painting, “War Wounds”? MB “War Wounds” was a partner piece to “Love and Death,” the first painting of the second line on my website. Both were a response to the horror stories coming from Iraq and Afghanistan. When I started these paintings I was thinking of Rousseau’s horror story, but also of the small paintings (the size of playing cards) that nuns did in the 16th century to meditate on the pain and suffering of Christ and the Saints, to try to enter the state of mind and share the terror and passion with them. GW The birds in the painting are not carrion eaters. They seem to inhabit an entirely different dimension, maybe even a different time. Yet at the same time, they are a haunting presence. MB The birds in my pieces are an assortment of passers-by or watchers (the wood stork and godwit) ; I think Nature is more of a constant, a mix of beauty and death, that is just the matrix of human actions, not a cause or contributor to the story. GW Unlike the passive blue sky background in Rousseau, your sky is highly charged with all sorts of objects and figures. For example, what are those wormlike tangles? MB I found the sky in my paintings felt flat and empty next to the turmoil in the land. Suddenly, I realized that the clouds could be anything, knots, abstracted hats, barbells, even people writhing in the sky. They gradually became more complex. The flecks and daubs of paint added a physical energy (almost like molecules, atoms, strings) and I was amazed to find that they seemed to add up to “Sky”. GW In contrast to how the bodies seem to bleed directly into the earth with Rousseau, the way the wounded and destroyed bodies are placed in your landscape, it almost has the sense of a sculpture garden, almost as if they have been found, possibly washed up on the beach, and then carefully arranged, put on display. And also, while they are broken and contorted, they are not yet dead. GW I am very struck by the hands rising from the wounds, indicating some obscure semiotic. I have always loved the Brothers Grimm tale about the young girl who is very stubborn and willful, so much so that when she is dead and buried, her arm keeps pushing through the dirt, as if to say, “I am still here,” and of course this is one quality that is both admirable and dangerous about humans. What are those willful hands telling us, signing from the dunes? MB I think “I am still here” is a fairly accurate translation of the wounds and severings. One person lovingly cradles his/her hands with bloody stumps. Hands appear over the hill in a V-victory sign, or pointing like a kid’s play gun, or with a raised index figure “I’m no. 1,” absurd gestures in an absurd world. GW You have spoken about your desire to find a way of figuring the human body that is drained of specificity, abstracted, yet also quite identifiably human. Can you tell a bit more about how you arrived at your aesthetic of figurative abstraction? MB As I mentioned, I used to paint portraits and anatomically accurate (or somewhat more accurate) figures, but I found that people would look to see who the person was and what their emotions were. I wanted to tell less specific stories, ones of ideas not personalities. It took some fumbling and messes to arrive at these fleshy, generic approximations of people, but they seemed to represent life, and I could bend them in any way I wanted. GW Finally, I am struck by the paint tubes in the foreground, part of the flotsam and jetsam of the battle, or whatever it was. I immediately thought: yes, art is part of this woundscape, too. Where is the artist in our larger landscape of everyday atrocities, the endless tales of cruelty and violence? MB The paint tubes, I feel, are an optimistic statement of creation; this landscape can be changed by a little paint; in fact the whole vision is only paint, but it can tell any story. The landscape is a matrix: we exist in it, but it also exists without us. It may go back to an empty Eden without us. I believe in “humanity” and I hope for a rational wrestling with our “problems.” I think of my paintings as prods and lures, meaning to push toward an alternative way of thinking. I think we are still in Eden with a last chance; think that we can find beauty and meaning in Nature; think that there are alternative ways of doing things. Editor’s Note: Morgan Bulkeley lives on Mt. Washington and paints in Great Barrington.